Are you Muay Thai Fit? 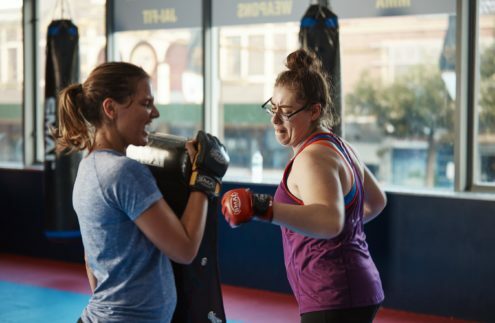 Muay Thai Fit (MTF) is our brand new morning fitness program. A combination of Muay Thai, Functional Training, Body Weight Training and Resistance Training packaged into a 45 minute TOTAL BODY WORKOUT. Muay Thai: Also known as the Art of 8 Limbs. Muay Thai is a total body workout that uses your fists, elbows, knees and feet for a complete workout. 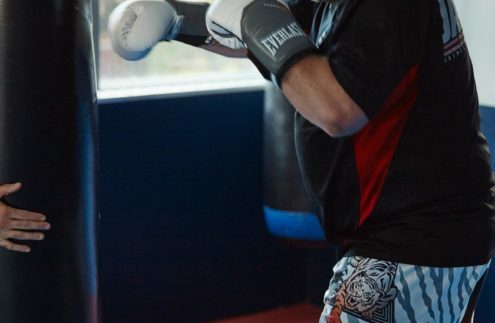 Our regular Muay Thai classes are a great option for many parents looking for a great workout while at the same time learning some new skills and making some new friends. In MTF there is NO CONTACT. The only thing that gets hit are the pads and bags! Functional Training: This style of training is all about moving the body to suit your lifestyle, moving in ways that you would normally move in your daily schedule – there are no strange, complicated or dangerous exercise movements here! In this component of the workout we look to strengthen the entire body through a series of movements that use many muscle groups, the end result – fat loss and lean muscle. Body Weight Training: Our body is that one thing that we take with us EVERYWHERE WE GO, yet is more often the thing we neglect the most. Body Weight Training is about you and your body, exercise without the need for added resistance is a great way to combine strength and cardio into the workout. We can achieve so many great benefits of exercise with using just YOU! Resistance Training: Through the use of Medicine Balls and Dumbbells we look to challenge the body by increasing our work load. By lifting weights you will burn fat and build lean muscle. This program doesnt create body builders, but we can help create strong, lean and healthy bodies. Join us Saturday morning from 7.45am for MTF. Remember to wear comfortable exercise clothing and to bring gloves if you have them. With all of our classes, aim to arrive at least 5 minutes before the scheduled start time. For more information about the benefits of our program click here.